A night of clubbing calls for something a bit fancier than your minifig torso t-shirt (I know I look good in it, but these places have dress codes) and at least for the forseeable future, you've got two options -- the multi-colored buckled heel from Steve Madden ($99.95) or the closed front cage sandal from Balenciaga ($4,175). What, most of you who play with LEGO bricks don't wear heels? Well, it's time you updated your wardrobe or we helped to change the demographics a bit. 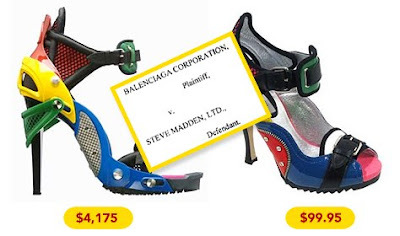 But you should save up because you may be limited to only the high-end model in the future as Balenciaga has filed suit against Steve Madden claiming copyright and trademark infringement (via Andy). Why can't we all be inspired by LEGO bricks and figure out how to play nice? The fate of the primary-colored shoe market hangs in the balance. In the interim, I'll be busy trying to figure out how to wedge my feet into these. Image via CityFile New York. I'm kinda of a fan of these.